Product #16836 | SKU UWPX7K42 | 0.0 (no ratings yet) Thanks for your rating! 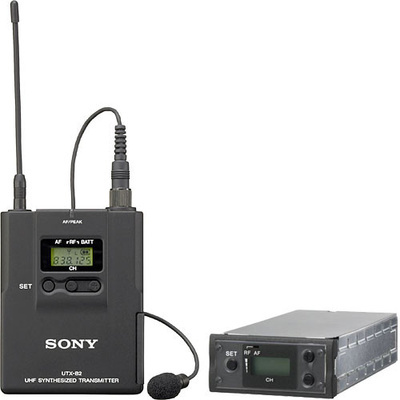 The Sony UWP-X7 Wireless Microphone System consists of the UT-B2X bodypack transmitter, unidirectional (cardioid) lavalier microphone and URX-M2 tuner module. The system is intended for hands-free wireless operation in broadcast, presentation, theatre applications, etc. The bodypack features a mic/line selectable input and 188 selectable UHF frequencies for optimum operation. Space diveristy reception further minimises drop-out radio-frequency interference and noise. The URX-M2 tuner module features a modular design and easily instals into the MB-X6 Tuner Base, SRPX500P and SRPX700P digital powered mixers. Both transmitter and receiver provide 188 user selectable frequencies, providing plenty of options when interference is present. The compact tuner-module is designed to interface with compatible Sony base units such as the MB-X6 receiver unit. A high-quality uni-directional lavalier microphone provides the sonic quality needed to handle professional and non-professional applications.